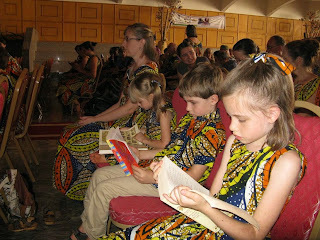 Yes, that would be all three of my children reading while waiting for a wedding to start. Cameroonian weddings involve all the guests having outfits made from fabric chosen by the bride and groom, in case you are wondering about the matching outfits. :) They also involve a fair amount of sitting around and waiting for the next thing to happen, so I'm glad I thought to have each of them bring a book. Apparently this is kind of a strange thing for children to do, though, as I had one person comment that it was so nice to see children reading rather than playing with electronics, and someone else (an adult) comment to my 9 year old that he had never read a book that thick. Who knew we were so radical? I can't keep up with this girl's reading anymore. She's read LOTS. But a recent favorite was Mrs. Frisby and the Rats of Nimh. She's read it about 5 times in the last 2 months, and she even prompted me to go read it again since she wanted to talk about it with me and I couldn't remember much more than the very basic outline of the plot from my childhood reading of it. J She's also been enjoying the Noel Streatfield Shoes books – Ballet Shoes, Theatre Shoes, and Dancing Shoes are the ones that we have. She is particularly delighted by the references to Shakespeare in these books – thank you AO! We continue to buddy read each day from the Thornton Burgess books – currently just about finished with The Adventures of Johnny Chuck. He's also enjoyed reading from our Thomas the Tank Engine treasury (these are the original stories, not the based-on-the-cartoon ones). He dips in and out of lots of other books too…I think I need to start challenging him to read through some chapter books on his own rather than just dipping. We just finished Along Came a Dog, a Year 2 free reading choice. This was a surprise favorite for my crew. It's a fairly simple story about a little red hen who loses her toes when her feet freeze (so she trots about on her 'knucklebones') and the big, black stray dog that protects her. I've caught James and Elizabeth pretend-playing that they are the little red hen and the black dog several times in the past few days, and all three children came dashing into the kitchen when I was preparing the Thanksgiving chicken last week to see the feet (whole chickens are always sold with the feet here) so I could show them which part exactly were the knucklebones. Who'd-a-thunk? Next up is The Lion, the Witch, and the Wardrobe. Their first trip to Narnia. I'm almost giddy with excitement. 'Nuff said. We are reading the Little House books as our bedtime story lately, and my boys are loving them more than any other. I think it's not possible to get tired of the Little House books. One of my great delights of mothering and homeschooling are sharing all of these book "friends" of my own childhood with my children. I figured we aren't QUITE to Y4 yet because we came to AO late, but she IS 9 and technically could be if we had started AO at the beginning, so it's time. :) They are loving it so far...I've already had to take the box with the other six books in it and put it away in my closet because they were trying to get into it and read ahead (even the 4yo who can't read yet, LOL.) We're going to read through them aloud, and then I will put them on the shelf for them to dip in and out of at will. We might revisit in a good audio version next year too since we'll be doing quite a bit of road travel to visit family, etc, while in the States next year.